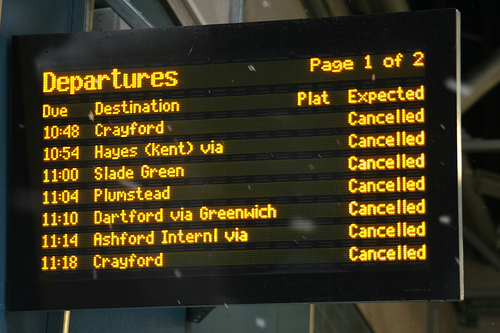 Posted 19th March 2013 by peterdixon in Advice, Delays, Problems on trains. Train delays can be an extremely frustrating experience. It is not just the time that you lose at the end of your journey (work time or time at home) but also the delay itself, particularly missed connections or a lack of information. Train operators have improved their communications significantly with tools such as Twitter and Facebook in recent years, but there is still room for improvement when services go wrong. When it comes to complaining about train delays, Train Operators need to know which services were you intending to travel on and what actually happened? In addition, it assists operators if you can provide any comments on the experience. Include any areas where information was lacking, where the service could be improved – or even where it worked well. This helps operators identify areas where they can improve, and also recognise which processes do not need changing. It’s always good to make sure the higher management know about staff who are doing a good job in difficult circumstances, too. Once you’ve put together this information, you can of course send it to the train operator via FixMyTransport. I use the notebook tool on my phone to record information that I think will be useful. It allows me to note events as they happen, and add thoughts about what is going on. I can then alter it later into a structure that a representative at the train operator would understand, and be able to act on. Operators will ask you for your ticket if there is an opportunity for offering you compensation. If you send your tickets to them, you should take a copy first: either photocopy them, scan or take a picture. This means that you still have a record in case they are lost or misplaced. What about after I have asked for a train refund? There are two complaints that we see on FixMyTransport after passengers have submitted a refund request. If you have not received a response, it depends on how long has elapsed since you submitted your complaints. Most operators aim to respond to all complaints within twenty working days. If this time has passed you should contact Passenger Focus. If they have lost your tickets, you should have taken a copy of them and you should be able to send that copy to them. If you have not taken a copy, my advice would be to look for any further proof such as a receipt or bank statement. You should discuss if there are any options for using this as evidence. I hope this post makes it easier for you to report delays on your train journeys. If you have any comments, leave a note below. Or you can email them to us, Tweet us or post them on Facebook.